Orders this month ship out next month between the 8th and the 15th! Hurry! Orders must be in by the last day of the month! 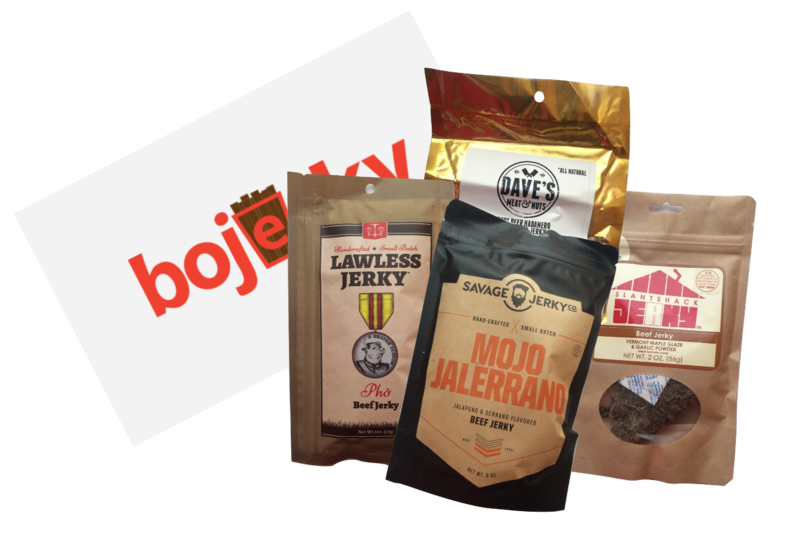 Bojerky is a Premium Beef Jerky Subscription Box. from ALL Around the United States. Bojerky is a subscription to craft jerky. Not only that, it's a subscription to the *best* jerky around. You tired of the same old stuff you get at the gas station on the way to work every day? You need bojerky. You want to eat coca-cola jerky from houston and then something grass-fed from Vermont? You need bojerky. You want to impress all your friends with your amazing selection of smoked and dried meats? You get the point. Bojerky is the best compilation of jerky you're going to get in the mail, I pretty much guarantee it. We offer several variations of subscription that will satiate any jerky lover. Bojerky is pretty simple. We buy the coolest indie jerky from around the US and send it to you. Maybe you live in San Jose but want some jerky from Minnetonka; we got you covered. Shipments are recurring so in the middle of every month, we ship awesome craft jerky straight to you. We've featured dozens of craft jerky creators- and not just hipsters in LA. We break the mold and buy from everybody. Even old crotchety men who live in the swamps. They make the best jerky. A few days before it gets to you, we'll send out an email with the tracking number so you know when it arrives plus a little bit of info about all the jerky inside. Sometimes we even include a bonus snack! We also cater to events and parties! If you're looking to give 10+ people bojerky at a time, email us to get a special deal. Disclaimer: I'm going to email you occasional updates about bojerky. Don't get this jerky if you've got food allergies. Don't get this jerky if eating certain foods makes you sick. If you're worried about jerky when you get it, don't eat it, I'll refund you.. If you want to eat it despite me saying this, check out the manufacturing company's website. This is pretty basic stuff, I think. If you see me on the street and I'm eating jerky and you said you read the disclaimer, you can have my jerky.